After two years, we have learned that Seattle university adjuncts voted 73-63 to join SEIU 925. Why the delay? The University was unwilling to bargain collectively with its contingent faculty voluntarily, and when the adjuncts turned to the labor board for help, the administration fought the board by invoking freedom of religion. The university, like Duquesne, St. Xavier and a handful of others, is trying to suggest it’s in the same situation as Catholic employers told to provide contraception under the Affordable Care Act – though unlike those employers, the colleges are not being asked to do anything in conflict with their faith. The NLRB did modify its initial determination in deference to religious freedom issues. At both St. Xavier University and Seattle the NLRB announced that religion and/or theology instructors are not subject to the National Labor Relations Act on First Amendment grounds. It is indeed essential to preserve our freedom of religion, and to a layman this certainly sounds like a reasonable application of the law. Still, I hope that these and other schools will choose to bargain with religion and theology faculty who want a union – not because of legal sanctions, but just to lead by example and conform with Catholic social teaching. Meanwhile, on the West Coast, in July Providence Health and Services and St. Joseph Health merged to form a huge health care system stretching from Southern California to Alaska: Providence St. Joseph. Providence has long been known for good labor relations and fair treatment of workers; St Joseph, not so much. Which management style will characterize the new system? A positive sign: within weeks of the merger, Providence St. Joseph and the California Nurses Association settled a long-running contract dispute that had embroiled four former St. Joseph hospitals. Unfortunately, it seems the spirit of teamwork hasn’t reached St. Jude hospital in Fullerton. When nurses there sought to form a union, the hospital hired a “union avoidance” consultant and used heavy-handed tactics to fight the organizing campaign. They are facing unfair labor practice charges before the NLRB for surveillance and intimidation of union supporters. Two apparently unrelated demographic stories caught my eye in recent weeks — because they both described the declining place of labor in modern America. Out of Georgetown came a study showing that high-school graduates have been virtually locked out of the economic recovery. Meanwhile, the Centers for Disease Control reported on suicide rates by occupational group: while most white-collar occupations fell well below the national average of 20 suicides per 100,000 population, characteristic blue-collar occupations such as agriculture, construction, and mining workers topped the rankings. The suicide numbers appeared in the July 1, 2016 Morbidity and Mortality Weekly Report. (Being both mortal and morbid, I subscribe to this.) While the suicide rate for American men overall was about 40 per 100K, it was 48 per 100K for those in installation, maintenance and repair occupations, 52 per 100K in the construction and mining sectors, and a frightening 91 per 100K in farming, fishing and forestry. Perhaps some of the explanation can be found in the Georgetown University Center on Education and the Workforce report America’s Divided Recovery: College Haves and Have-Nots. Today’s workforce is divided roughly in thirds: one-third with a 4-year college degree or more, one third with some college education, and one-third with a high school diploma or less. The economic recovery has now generated more than 11 million new jobs, but only 1% went to workers without any college education. Not long ago America was a place where anyone who graduated high school and was prepared to work hard could expect to earn a salary sufficient to support a family. There are a lot of reasons that this has changed, but one of them is the decline of unions – a shift that has reduced the bargaining power of the worker vs the other economic actors in society. The economists tell us that today’s free market economy, unencumbered by unions, is more efficient. Be it so: is efficiency the only criteria by which we judge an economy? Or is it worth paying a few dollars more for your smartphone, car or movie ticket if it enables one-third of our nation’s men and women a vocation and life with dignity? What usually strikes me when I go to one of the conferences downtown is how starkly different is the language of most policy experts from the language of Catholic social doctrine. But, when you go to an event with organized labor, that difference shrinks. They may not use the same language, but the language they use is deeply moral, suspicious of abstractions at the expense of real world consequences, focused on the human person more than on the “laws of the market” or, for that matter, the laws of the state. There is a more honest admission of what we would call original sin and they call power, greed and self-interest, than you find in other progressive circles. I feel at home. Click HERE to read Winters’ piece in its entirety. I used to think the word “worker” in “Catholic Worker Movement” referred to the Works of Mercy accomplished by its members. But a new encounter with the thought of Dorothy Day, Servant of God, and Peter Maurin, through staffing the Archdiocese of New York’s canonization Inquiry into her life, taught me that the Movement has a historic, multi-layered relationship with low-wage workers and their struggles. The Catholic Worker emerged in the 1930’s against a backdrop of worker movements. The Catholic Worker name itself is a play on the communist Daily Worker newspaper. Like Pope Leo XIII, Dorothy Day believed the Church needed to offer an alternative to workers caught between accepting exploitation in the workplace and adopting atheistic communism. Day lifted up the Gospel and Church teaching against the abuses of the times, but in 1949, she targeted the Church itself. The strike was settled two months later, after an appeal from the gravediggers’ wives, a change in union representation, and a fractional increase in the archdiocesan offer. The six-day work week stayed. But Dorothy Day had made a point that the Church as an employer is not exempt from its own teaching—an argument which still arises, on the one hand to castigate Catholic universities for miserly payment of adjuncts, on the other to congratulate Society of St. Vincent de Paul stores for making a new commitment to pay a living wage. But the Catholic Worker commitment to low wage workers goes farther than simply supporting unions. 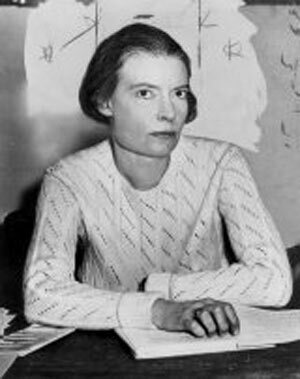 Dorothy Day, influenced by Peter Maurin, went a step further—advocating for worker owned businesses and farm cooperatives through an economic philosophy called distributism. Distributism salutes capitalism by insisting that its enormous ability to create wealth go to work to enrich the lives of ordinary people—not just the rich—through worker-owned enterprises. As the Church sorts through questions of Dorothy Day’s sanctity, we would all do well to embrace the holiness of her many efforts on behalf of and with low-wage workers. Jeffry Korgen is assisting the Archdiocese of New York prepare evidence for the cause of Day’s canonization. He can be reached at jkorgen@korgenassociates.org. As anniversaries go, the 125th of modern Catholic social thought is a non-starter except perhaps in a small circle of specialists. Yet Catholic social thought offers a timely perspective on our society’s clash between what some people call our nanny-state and the libertarian free-for-all favored by others. Catholic social thought also suggests a way out of the paradox presented by a rejection of more taxes coupled with the desire for more services. Further, it has interesting things to say about the environment, wages, eldercare, parental responsibility and lots more. It was 1891 when Pope Leo XIII (1810-1903) issued the first modern social encyclical. It is published in English under several titles; On the Condition of Labor being the most popular. 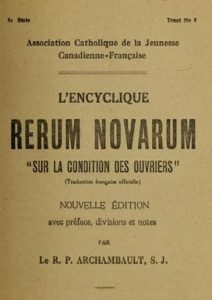 It is also still referenced by its Latin title, Rerum Novarum. Catholicism says that short of the Garden of Eden, each society should approximate “the kingdom on earth.” That is, given the sin of the world, there is still an opportunity to apply realistic though general social principles to economics, culture and politics—first locally and eventually between countries. These principles are derived from Scripture and from the long reflection of Christians in hundreds and hundreds of settings. These principles are not doctrinally binding on non-Catholics. They are, however, deliberately framed in civic language so that they can be persuasive in any setting. And, not surprisingly, other religious traditions have the same social principles. Not all religious traditions, it should be noted, use the same method as Catholicism on social ethics—on, for example, issues related to labor relations, medical intervention, social service delivery and more. The difference in method often goes unappreciated when parties disagree on an issue, or agree for that matter. There is no definitive list of Catholic principles. Most lists include: the inherent dignity of each life, social justice, subsidiarity, the common good, participation through bona fide labor unions and other mediating structures, and preferential option for the poor. Others are: preferential option for youth, gratuitousness, distributive justice, solidarity, family wage, universal destination of goods and a few more, topping out at, let’s say, 25 principles. The principles overlap and one should not be pulled too far from the others. Finally and with emphasis, these are general social principles. Their specific application is the job of informed Catholics in concert with like-minded people inside their company, hospital, college, labor local, community group, professional association or legislative hall. Two equally moral parties can disagree once the application comes down to a specific policy. This important point is why I use the term Catholic social thought, rather than top-down social teaching. 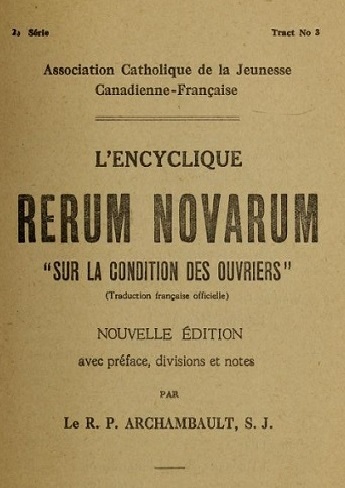 While the papal encyclicals, beginning with the 1891 On the Condition of Labor, are the backbone, the full complement of Catholic social thought must include other ecclesial statements, some position papers from Catholic lay groups and the collective reflection of Catholics around the world on their experience. Of course, the social thought of the laity has to be consonant with the encyclicals and all the other pieces. One individual does not act or speak for the church. A prominent member of Congress, for example, says he is informed by Catholic thought and that his policy ideas flow from there. Not so, however, in his case. He is libertarian, even flirting with the extreme ideas of Ayn Rand (1905-1982). Next up: Pope Leo XIII’s themes. The Catholic Case for Donald Trump? http://catholiclabor.org/wp-content/uploads/2015/10/CLN-logo_565x100.jpg 0 0 Clayton Sinyai http://catholiclabor.org/wp-content/uploads/2015/10/CLN-logo_565x100.jpg Clayton Sinyai2016-05-31 15:45:362016-05-31 15:46:38The Catholic Case for Donald Trump? So far 2016 has been a good year for the legions of social justice activists inspired by Dorothy Day, founder of the Catholic Worker movement. In April came news that the cause of Day’s canonization had taken an important step forward as Cardinal Dolan of New York had begun to review evidence from her life and actions to determine if she lived a life of “heroic virtue” and merits recommendation to the Congregation for the Causes of Saints in Rome. There is the world of meritocracy and the world of grace. There is the world of: I worked hard and I deserve what I have. And there is the world of: There but for the grace of God and others I could be. In 2005 Hamdi Ulukaya founded Chobani Yogurt in Norwich, NY. He hired five workers. Chobani is now the top-selling yogurt brand with over 2,000 employees at its New York and Idaho plants. Ulukaya, a Kurdish immigrant, is quite wealthy. Late last month Ulukaya told his employees about a gift. He is giving each of them shares in the company, totaling about 10% of the company’s worth. The initial math estimates the gift on average to be $150,000. Some workers will get more and the final calculation may well increase the average. “I cannot think of Chobani being built without all these people,” Ulukaya told the N.Y. Times (4/26/16). Ulukaya has long said that a company’s moral conduct, including better pay, leads to success. Companies, he told another interviewer, must look beyond the so-called bottom line. “Business is still the strongest, most effective way to change the world,” Ulukaya said. Matthew does not tell us the precise motivation of the vineyard owner. Ulukaya, like all of us, does everything for multiple motives. The two employers though share a world view. They have a similar conviction about the nature of reality. And this is important: their business disposition comes irrespective of life’s ups and downs. The vineyard owner and the yogurt executive both suspect that inexplicable generosity haunts the world. They believe that the proper response to the gift of life and to all of life’s gifts is to give the gift away. Neither executive denies suffering. Misery is part of the human condition. Specifically, Ulukaya has experienced business and personal failures. The same was probably true for Matthew’s agricultural executive. Neither executive thinks that a gratitude attitude means acquiesce to injustice. Nor is there evidence that either thinks business is for saps. They are realists whose take on things includes appreciation for the powerful but unpredictable spirit of benevolence. A world centered on meritocracy is always filled with cynicism and resentment. Those who live only by the art of the deal are always incomplete people who usually cannot sustain their ventures. Droel edits INITIATIVES (PO Box 291102, Chicago, IL 60629).